Originally developed by Darrell May. The latest version of smeserver-wbl is available in the SME repository, click on the version number(s) for more information. 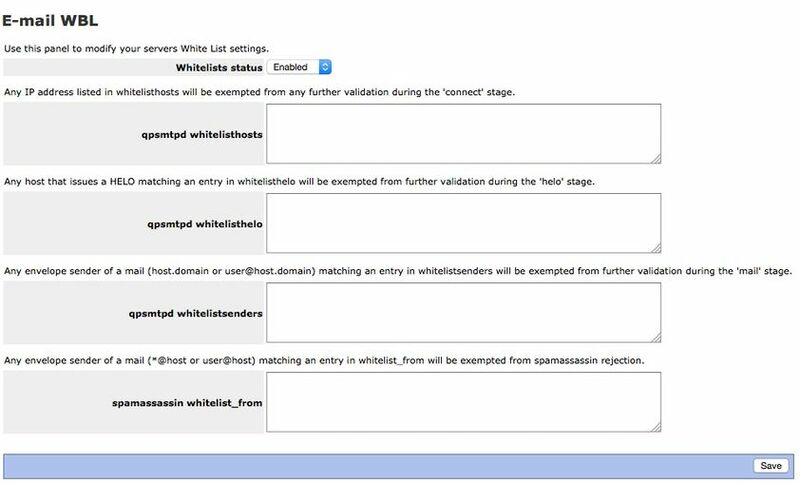 This contrib provides a server-manager panel to designate user defined email whitelists and blacklists. An email whitelist is a list of hosts, domains, or email addresses which will be accepted by SME Server regardless of possible spam content or origin. Administrators should use caution when using whitelists as email coming from whitelisted addresses will bypass many of the mechanisms that SME provides for identifying unsafe email messages. An email blacklist is a list of hosts, domains, or email addresses that will be blocked all of the time. Once you do this a new menu item will be visable in the Server-Manager on the left hand side, called E-mail WBL. Clicking on this will present you with 2 buttons. E-mail traffic is scanned and may be blocked due to the various screening methods enabled. You may use this panel to define e-mail white/black lists. Black lists are used for rejecting e-mail traffic. White lists are used for accepting e-mail traffic. If you press the Black List button you will see the following window. If you press the White List button you will see the following window. Execute the email-update event now to restart services and load in your changes. This will apply any of the changes you made in the Reject or Accept windows. 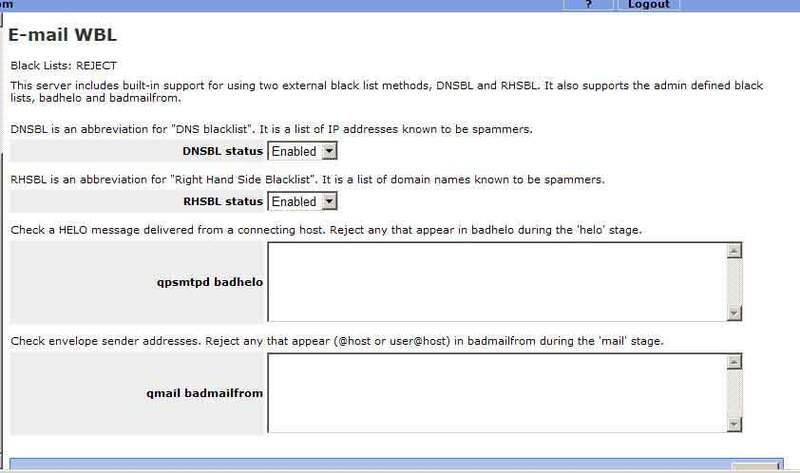 The qpsmtpd badhelo is effective in examining the SMTP HELO string and then block mail based on this string. Entries follow the following format. To find the proper string to enter on the qpsmtp badhelo line. 1. Open an offending email. 2. Open the header of the email. 3. Look for a line that says, (HELO something.a.somehost.com) Partial strings will not work, E.G. in the previous example somehost.com will not work. It must be the complete HELO string. Using qpsmtpd badhelo will stop all mail at a domain that uses that specific HELO string. It's not looking at a specific email. This strategy isn't always effective as spammers generally change this field to stop this kind of detection. Also companies have several SMTP gateways so you may see mail from mail1.domain.com and mail2.domain.com . You will then need to add both of these. The advantage however is if you do want to stop all mail from one source, it can be effective. Received: from smtprelay0207.c.somehost.com (HELO smtprelay.c.somehost.com) (123.111.123.321) Now simply add the IP address you found in the HELO line. Please raise bugs under the SME Contribs section in bugzilla . This page was last modified on 26 November 2018, at 15:31.